Just a few days ago, we looked briefly at the life and ministry of the Rev. Dr. Francis Herron. This Lord’s Day we present the sermon delivered by the Rev. William M. Paxton, in 1861, on the occasion of Dr. Herron’s death. In good 19th-century fashion, the sermon is in places somewhat flowery to modern sensibilities. Still, it provides a good example of an appropriate sermon for a significant pastor, one who was greatly used of the Lord. “My Father, My Father, the chariot of Israel and the horsemen thereof.“–2 Kings 2:12. Never, perhaps, had the name Father been uttered in deeper grief, or with warmer affection. Elijah, the Prophet Father and Elisha, the Prophet Son, were bound together by no ordinary ties of endearment. When it became manifest to the old Prophet that he must ere long retire from his sacred office, and i was indicated as the will of God that Elisha should fill his place, Elijah sought him, and, throwing his own mantle upon him, indicated and installed him as his successor. Accordingly, Elisha bade farewell to the home of his youth, and crossed the mountains of Gilead to take part in the ministry of the old Prophet, and to comfort and cheer him with the ready offices of kindness and affection. From that time they lived and labored together in the intimacy of a harmonious fellowship and reciprocated attachment. It was no ordinary friendship that bound them to each other. They had one interest, one aim, one motive, one sphere of blessed, holy, consecrated action; but deeper than this was the affinity of congenial temperament, the unity of kindred sympathies, the harmony of feeling strung to the same key; and deeper still, the affiance of grace, the common experience of the love of God, and the endearing intimacy of spiritual fellowship and communion which bound them together, heart and soul–wedding age and youth with a bond of perfectness. The life of Elijah was spared longer than he seemed at first to anticipate. It was doubtless so ordered in mercy to Elisha. He needed the experience of age to direct him, and the wisdom and instructions of the old Prophet to prepare and mature him for his future responsibilities. For a period of about ten years this happy association and co-operation in the work of God continued; but now at last the time arrived when they must part, Elijah to ascend into glory, and Elisha to bear the responsibilities of the sacred office alone. And now, Elisha stands alone. Oh, who can tell the solitary desolation of his spirit at that moment? The Friend, the Father, the Counsellor to whom he had always looked, is gone. He had never before been left to himself. Elijah had always been at his side. Did he need direction? Elijah was there. Had he a sorrow? Elijah’s heart was full of sympathy. Had he a joy? it was repeated in the joy of Elijah. But now, alas! he is alone, without his helper; solitary, without his comforter. With streaming eyes he follows the receding chariot, till his grief bursting into language he exclaims: “My Father, My Father, the chariot of Israel and the horsemen thereof!” It was the expression of his own personal grief. It was the deep outgushing of a stricken heart–the sorrow of one who felt that his earthly comforts, stays and supports had all been severed in one sad blow. “The mantle of the ascending Prophet, loosed by an invisible hand, had fallen from his shoulders, and it floated down before him heavy laden with an official appointment, cast to him as it were out of the open heavens.” He felt, therefore, that he was not only alone, but alone under the weight of accumulated responsibilities. He was now to carry on the work of God single handed, to bear the burden of the sacred office without a helper, and added to all this, he had to assume the cares and responsibilities of instruction and government in the schools of the Prophets. This is, therefore, the language of a heart greatly burdened, and pouring out in this single exclamation its great surge of responsibility and grief. But to this language of personal sorrow, he adds also that of religious and patriotic lamentation: “THE CHARIOT OF ISRAEL AND THE HORSEMENT THEREOF.” The thought was evidently caught from the scene before him; and the idea is, that whilst Elijah had been to him a father, he had been to Israel, to the Church and the Nation, a chariot and a horseman. His labors and prayers had been of more value than military defences. He had done more by his counsels and intercessions for the protection and security of his country than chariots and horsemen. Whilst he had lost a Father, Israel had been bereaved of its strength and security. Hence he combines the expression of personal sorrow, with that of religious and national lamentation. He was bereft of a Father, the Church of a Prophet, and the nation of a Defender. Now, my dear friends, all this is only too vividly realized in the bereavement that hangs this pulpit in mourning, and fills this church and community with sorrow. It may gratify our feelings of personal sorrow to recount the events of his life, and deepen our conviction of the loss which the Church and the Nation has sustained, to estimate his character and worth. From here, Rev. Paxton turned to a narrative of the life of the Rev. 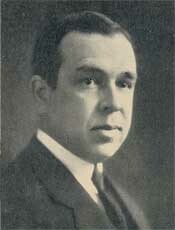 Dr. Francis Herron. Click here to continue reading his sermon. The remainder of the sermon continues from page 23 of the memorial. Two Discourses upon The Life and Character of the Rev. 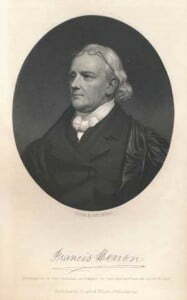 Francis Herron, D.D., by the Rev. William M. Paxton, D.D., Pastor of the First Presbyterian Church, Pittsburgh. Preached and Published at the Request of the Board of Trustees and the Session of the Church. Pittsburgh: Robert S. Davis, No. 93 Wood Street, 1861. Press of W. G. Johnston & Co.
June 28: Francis Herron, D.D. Born, in Franklin County, Pennsylvania, June 28, 1774. Graduated, at Dickinson College, Carlisle, Pennsylvania, May 5, 1794. LIcensed to Preach, by the Presbytery of Carlisle, Pennsylvania, October 4, 1797. Ordained to the ministry and Installed as Pastor of the Presbyterian Church at Rocky Spring, Franklin County, PA, April 9, 1809. Removed to Pittsburgh, and Settled as Pastor of the First Presbyterian Church, May, 1811. Resigned his Pastoral Charge, December 1850. Francis Herron was born near Shippensburg, Cumberland county, Pennsylvania, on June 28, 1774. He belonged to that honored and honorable race, the Scotch-Irish, memorable in the history of the world, but especially in our country, for a thorough devotion to evangelical truth and constitutional liberty. The training of his early years bore rich fruit at a subsequent period of his life, making him so eminent among his brethren as an effective preacher and an orthodox divine. Receiving the careful training indicative of his parents high regard for knowledge, he entered Dickinson College, Carlisle, PA, then under the care of that distinguished Presbyterian, Rev. Dr. Nesbitt. Here he completed his classical course, and graduated May 5, 1794. The prayers of his pious parents were answered by the influence of grace upon his heart, and he was led to study for the ministry of reconciliation. 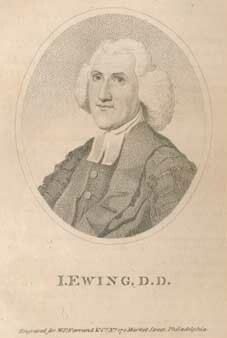 He studied Theology under Robert Cooper, D.D., his pastor, and was licensed by Carlisle Presbytery, October 4, 1797. He entered upon his Lord’s service as a missionary, going out into the backwoods, as it was then called, passing through Pittsburgh, Pa., then a small village, and extending his tour as far west as Chillicothe, Ohio. Stopping for the night at a tavern at Six Mile Run, near Wilkinsburg, Pa., the people prevailed upon him to stay till the following Sabbath, which he did, and under the shade of an apple tree this young disciple broke the bread of life to the people. His journey resumed the next day, and with a frontier settler for his guide, he pushed on to his destination through an almost unbroken wilderness, his course often guided by the “blazes” upon the trees. Two nights he encamped with the Indians, who were quite numerous near what is now the town of Marietta, Ohio. On his return from Chillicothe, Ohio, he visited Pittsburgh. The keeper of the tavern where he lodged, proved to be an old acquaintance, and at his request, he consented to preach. Notice was sent, and in the evening a small congregation of about eighteen persons assembled. The house he preached in was a rude structure, built of logs, occupying the site of the present First Presbyterian church. And such was the primitive style of that day, that during the services the swallows, who had their nests in the eaves, flew among the congregation. 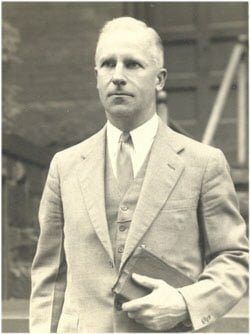 At this time the churches in that portion of our country were visited with a season of refreshing grace, and Mr. Herron entered into the revival with all the ardor of youth filled with hopefulness and zeal. He preached for Rev. Dr. John McMillan at the Chartiers church, during a revival season. He also preached at the Buffalo church, where his fervid eloquence made a deep impression and the people presented him a call, and strongly urged it upon his attention. He however concluded to return to the vicinity of his home, especially, as a call from Rocky Spring church was awaiting him. This call he accepted, and he was ordained and installed as pastor of that church, by Carlisle Presbytery, April 9, 1800. Some ten years later, he was invited to occupy the pulpit of the First Presbyterian church, then vacant by the recent death of Rev. Robert Steele. The people were charmed with his discourse, his ripening intellect modified by that refined spirituality, which was a prominent element in his ministrations, had a powerful effect upon his audience. They urged him to preach for them a second time, which he did, the result was a unanimous call was made out and presented to him in the usual manner. The Presbytery of Carlisle dissolved the relation that existed between Rocky Spring church and Mr. Herron, and he was dismissed to Redstone Presbytery, April 3, 1811, and he was installed pastor of the First Presbyterian church, Pittsburgh, PA, the following June. In a few weeks he removed with his family to his new home, travelling in a large wagon, with his wife, children, and all his household goods. He joined Redstone Presbytery June 18, 1811. The importance of his new position was fully and truly felt, the commercial importance of Pittsburgh had given all kinds of business an impetus, and prosperity was advancing rapidly; but this outward show referred only to worldly affairs, the religious condition of the people was cold and almost lifeless. The church to which he was called was embarrassed with debt, and the piety of the people manifested a degree of conformity to the world, which nearly appalled the preacher’s heart. But the experience of his ten years pastorate was to him invaluable, and girding himself, he entered upon his duties with a true heart and an earnest purpose. His preaching was the simple exposition of the truth as it is in Jesus, pointed, clear, and unwavering, revealing the enormity of sin and pleading with the fidelity of one who loved their souls. This style of preaching was sustained by his efforts to establish the prayer-meeting, which, strange as it now appears, met with much opposition, even among professors of religion; but this young pastor knew the holy influence of communion with God, and that God favored a praying people, he therefore went forward, and, in connexion with Rev. 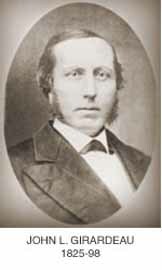 Thomas Hunt, who was pastor of the Second church, they persisted, and though to avoid a collision with the people the meetings were not held in the church, a small room was used for that purpose, in which Mr. Hunt taught a day-school. The first meeting consisted of the two pastors, one man, and six women, and thus for eighteen months did this meeting continue without adding a single person to their number. The chilling indifference of the people soon grew into downright hostility, and husbands and fathers prohibited their wives and daughters from attending, and, finally, when the continued efforts of these pious people could be no longer borne, they waited upon Mr. Herron and told him that it must be stopped, his reply was the turning point in the spiritual condition of that people. He said, “Gentlemen, these meetings will not stop, you are at liberty to do as you please; but I also have the liberty to worship God according to the dictates of my conscience, none daring to molest or make me afraid.” From that time a spirit of piety manifested itself among the members of the church, several gay and fashionable persons were hopefully converted, and an impression was made upon the whole community, at once hopeful and healthful. Do not expect courage of conviction from men who have no convictions, from those who have no anchor in the Word of God. The Scriptures must be drilled down deep into our souls if we are to stand against temptations and testings. May God give us pastors who will set an example, who will faithfully stand against the assaults of the world, the flesh and the devil. Words to Live By: It may be easy to look back from some later date and see the “right thing” to do. But it is obvious that there were unfounded rumors of wild drinking parties on Westminster Seminary grounds as well as a general lack of understanding by some elders of the challenges facing pastors of western churches. To be sure, the guiding wisdom of a J. Gresham Machen was missing from the assembly, with his entrance into the heavenly kingdom earlier that year. But all elders, both teaching and ruling elders, are to filled with the Spirit. They should live humbly in day to day reliance upon His enabling power, wisdom and guidance. Then, working within the framework of love, deal wisely with others who differ from them in points of contention. Let us learn to do this in our own circles. Shepard Kosciusko Kollock was born at Elizabeth, New Jersey, on June 25th, 1795. His father was an officer in the Revolutionary Army, and greatly admired the personal and military character of the Polish leader Kosciusko, and so gave that name, together with his own, to his youngest son. Shepard graduated from the College of New Jersey in 1812, at the age of seventeen and with high honors. After studying theology with his brother-in-law, the Rev. John McDowell, and his brother, Dr. Henry Kollock, Shepard was subsequently licensed to preach the Gospel by the Presbytery of South Caroline, in June of 1814. After preaching for three years in South Carolina and Georgia, Rev. Kollock received a call to serve the Presbyterian church in Oxford, North Carolina, and it was only at this point when he was finally ordained, by the Presbytery of Orange, on May 2nd, 1818. However, not long after this, he accepted an appointment as Professor of Rhetoric and Logic at the University of North Carolina, prompting him to resign his pulpit. In 1825 he became pastor of the Presbyterian church in Norfolk, Virginia, and continued there for about ten years, thereafter returning to New Jersey and for three years he was engaged as an agent for the Board of Domestic Missions of the Presbyterian Church, U.S.A. From about 1828 to 1848, Rev. Kollock was the pastor of the church in Burlington, and his final pastorate was in Greenwich. At last, worn out by a life of faithful labors, age and increasing infirmity, he resigned and came to live in Philadelphia in 1860. Death came at last on April 7, 1865. Dr. Kollock was a successful minister of the Gospel in all his charges, and a gentleman of culture of no common order. His Hints on Preaching without Reading, and Pastoral Reminiscences, were translated into French and published in Paris. He also contributed several valuable articles to the Princeton Review. In every age the Church has been pained by beholding persons whose professions were high and specious, declining from the truth, returning to the world, and again indulging in the lusts of the flesh. Such examples tend to afflict humble believers, and to fill them with apprehensions that their own state is unsafe, and may terminate in destruction. To prevent such an inference, the Scriptures, whenever they predict, or relate, the apostacy of those who had once “the form of godliness,” immediately subjoin, as a source of consolation, an assurance that the real children of God shall be preserved from defection. Thus the Saviour (Matt. xxiv.) foretelling the appearance of those who should come in his name, and “deceive many,” intimates that the elect shall not be deceived. Thus also the apostle John (1 John ii. 19.) having mentioned that many anti-christs were in the world who were generally apostates, adds: “They went out from us, but they were not of us; for if they had been of us, they would no doubt have continued with us; but they went out that they might be made manifest that they were not all of us;”—as if he had said, ‘Whatever plausible appearances they make, they prove, by becoming apostates, that they were hypocrites; for if they had been true believers, renewed by grace and vitally united to Christ, they would have persevered in communion with us; but they went out that they might appear to the world in the real characters of false-hearted professors. Such is the spirit of the language of Scripture, and in these, and other similar passages, is plainly taught the doctrine of THE PERSEVERANCE OF THE SAINTS. It is a doctrine which lies at the foundation of all the hope which the believer enjoys; it inspires confidence in danger, comfort in sorrow, succour in temptation, and is an “anchor to his soul,” amidst tempests the most violent. Let us inquire what reason we have to receive this doctrine as the truth of God. I. We shall definitely state the question at issue, and show what we mean when we maintain the final perseverance of the saints. II. We shall establish the doctrine by arguments. III. We shall answer the principal objections against it. When we say that the saints shall finally persevere, we mean not by the word saints those who, having made a profession, and possessing a semblance of religion, are regarded by others as pious; or those who are confidently esteemed by themselves as godly; or those who are only federally holy—by external consecration to God, as were the people of Israel. We grant that all these may finally and entirely apostasize. But by saints we mean those, and those only, who have really been born again; who have been brought from a state of enmity against God into a state of reconciliation and love; who have been justified, accepted and adopted; who are animated by the Holy Spirit, that dwelling both in Christ and them, forms an intimate union between him the head, and them the members. When we say that such persons shall not finally and entirely fall away from grace, we do not mean that their graces may not languish and decline. The question is not concerning the decay, but the loss of grace; not concerning sickness and debility, but total death. A person may faint away, showing no signs of animation, while a principle of life remains; and spiritual life may undergo so violent a shock as to be brought apparently to the very verge of death, and yet not be extinguished. Neither do we mean that the acts of grace shall never be interrupted; but only that the spirit and habit of it shall never be lost. We grant that the saints may fall into many and great sins; but we maintain that, through the presence of God cherishing the principles of spiritual life once implanted, they shall never so sin, as to fall into that state in which they were before conversion, and of the children of the Holy One, become the children of the devil. They may fall into transgressions that deserve perdition, but God will excite their repentance, animate their faith, enliven their hope, and thus keep them in his covenant and love. All who are truly regenerated and vitally united to Christ, though weak and frail in themselves, shall be so protected and kept by the power of God that the habits of grace shall never be entirely lost, nor the principle of spiritual life totally extinguished; and although they may fall into sins, yet they shall never fall from their interest in the covenant, but shall be renewed to repentance, and be at last brought, by a steady perseverance, to eternal salvation. II. To establish its truth. John Lycan Kirkpatrick was born in Mecklenburg County, North Carolina, on January 20, 1813. Alfred Nevin notes that his parents were pious Presbyterians, members of Providence Church, and that John was baptized by the Rev. James Wallis, pastor of that church. Nevin also provides information that his family moved to Morgan county, Georgia when he was four years old, and later to DeKalb county when he was 15. Kirkpatrick was educated at Franklin College, Athens, Georgia, attending there in 1830, and then transferring to Hampden-Sydney College and graduating there in 1832 with the Bachelor of Arts degree. He taught at Charlotte Court House, Virginia for two years, 1833-1834 and then moved on to train for the ministry at the Union Theological Seminary in Richmond, VA, 1834-1837. He was licensed to preach by West Hanover Presbytery in March of 1837 and ordained by the same Presbytery in November of that same year, being installed in his first pastorate at the Second Presbyterian Church in Lynchburg, VA. He served that church as pastor from 1837-1841, and in the second year of that pastorate, married Mary Elizabeth Turner of Lexington, VA. Rev. Kirkpatrick and his wife subsequently moved to Gainesville, Alabama when Rev. Kirkpatrick answered a call to pastor the PCUS church there, remaining in that post, his longest pastorate, from 1841-1853. He next served as pastor of the historic Glebe Street Church in Charleston, South Carolina from 1853-1860. 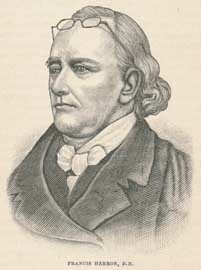 From roughly 1856 until 1860, Kirkpatrick served as the editor of The Southern Presbyterian. Undoubtedly many of his published works appeared in that journal, but we have been unable thus far to access that material. Leaving the Glebe Street Church, Rev. 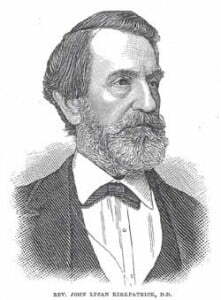 Kirkpatrick spent the remainder of his years in academia, serving first as president of Davidson College, from 1860-1866. Then from 1866-1885, he was Professor of Moral Philosophy at Washington & Lee University in Lexington, Virginia, and it was during these years that his wife died, on August 8, 1874. Rev. Kirkpatrick also served as interim supply for the Lexington Presbyterian Church, from the Spring of 1867 until August of 1868. He continued as Professor at the University until his death on June 24, 1885. Honors conferred on John Lycan Kirkpatrick during his life include the Doctor of Divinity degree, conferred by the University of Alabama in 1852. He had been a commissioner to the General Assembly of the Presbyterian Church, U.S.A. in both 1846 (as it met in Philadelphia) and 1854 (Buffalo, NY), and he also served as Moderator of the General Assembly of the Presbyterian Church in the Confederate States of America (PCCSA) in 1862. “Let no one look down on your youthfulness, but rather in speech, conduct, love, faith and purity, show yourself an example of those who believe.” (1 Timothy 4:12, KJV) — And if that is Paul’s charge for younger men, how much more so for older men, to live as befits the Gospel of our Lord Jesus Christ. Indeed, we must all, men and women, so live as examples of those who believe. In your speech, your conduct, your love, faith and purity, live day to day with the purpose of honoring and glorifying the Lord who saved you by His grace. Hunter, Robert F., Lexington Presbyterian Church, 1789-1989 (Lexington, VA : Lexington Presbyterian Church, 1991), p. 92. Nevin, Alfred, The Encyclopedia of the Presbyterian Church in the United States of America (Philadelphia : Presbyterian Encyclopedia Publishing Co., 1884), pp. 1172-1173. Scott, E.C., Ministerial Directory of the Presbyterian Church, U.S., 1861-1941 (Austin, TX : Press of Von Boeckmann-Jones Co., 1942), p. 379. Image source: Alfred Nevin, The Encyclopedia of the Presbyterian Church in the United States of America(1884), p. 1172. Oration delivered before the Philistorian Society of Georgetown College, D.C. on the 22d of February, 1840 … to which are prefixed the remarks of W.L. Warren, Ga., previous to his reading the farewell address of Washington. (Washington [D.C.?] : Jacob Gideon, Jr., 1840), 16 p.
The moral tendency of the doctrine of falling from grace examined. A sermon preached before the Synod of Alabama at the opening of its sessions in Gainesville, October 24th, 1844 (Mobile, Register and Journal Office, 1845), 28 p.
A sermon, preached on the occasion of the death of Mrs. Mary Chamberlain Brackett : in the Presbyterian Church, Gainesville, Ala., March 2, 1851 (St. Louis : Hill & M’Kee, printers, 1851), 24 p.
A funeral discourse, delivered on Sunday morning, April 10, 1859, in the Independent or Congregational (Circular) Church, of Charleston, on the death of the Rev. Reuben Post, D.D., late Pastor of that church (Charleston, S.C. : Walker, Evans & Co.’s Steam Powered Press, 1859), 32 p.
“ The Waldenses and Infant Baptism, ” in The Southern Presbyterian Review, 14.3 (October 1861) 399-430. Today’s entry is not easy reading. It is long, too. But it will reward your time, if you will set aside some time for thoughtful reading. The Rev. John L. Girardeau was one of the brightest lights of the old Southern Presbyterian Church. He gave much of his life to minister to the slaves of the seaboard of South Carolina. He wrote, “Having rejected a call to a large and important church which had very few Negroes connected with it, I accepted an invitation to preach to a small church, surrounded by a dense body of slaves.” As Dr. Otis Pickett has noted, “God had given him a heart for the Low-country blacks of Charleston, and he refused to leave them.” The Rev. John L. Girardeau passed on to his eternal reward on June 23, 1898. Text: Romans 1:17. For therein is the righteousness of God revealed from faith to faith: as it is written, The just shall live by faith. The Apostle Paul furnishes in this chapter a summary of his great argument, touching justification before God, in three leading propositions. He first states its conclusion–namely: The Gospel is the power of God unto salvation, to every one that believeth, to the Jew first, and also to the Greek; that is, to all sinners of every class. But why is the Gospel such a power? Because, in the second place he declares, therein is the righteousness of God revealed from faith to faith. But why was such a righteousness necessary? Because, in the third place he affirms, the wrath of God is revealed from heaven against all ungodliness and unrighteousness of men. To make this general statement of the argument perfectly clear, let us invert the order of the propositions, so as to present the reasons first and the conclusion last. First. The wrath of God is revealed from heaven against all ungodliness and unrighteousness of men. That is to say, all men are ungodly and unrighteous; they are therefore guilty before God and justly exposed to His wrath. Secondly. God has provided a way of escape from His wrath for guilty men. He has revealed His righteousness to them, and declared that whosoever believes in it shall live. Thirdly. This righteousness of God the Gospel alone reveals, and therefore the Gospel is the power of God unto salvation. It is evident that the second of these propositions, either in the Apostle’s order of statement or the inverse, is that which gives an answer to the question, How can a sinner escape the wrath of God, and be justified and saved? How? He must by faith accept and rely upon the righteousness of God. He who is justified by faith in the righteousness of God shall live. This is the inspired Apostle’s account of God’s method of justifying and saving sinners. Let us examine the different answers which men give to the great question. How may we as sinners be justified and saved? 1. His justice would be sacrificed. 2. His law would be sacrificed. 3. His truth would be sacrificed. 4. His holiness would be sacrificed. It [His holiness] forbids fellowship with the unholy, and none can be holy except they be first justified. This supposition requires that the standard of mercy should be planted on the graves of justice, truth and holiness. 5. The interests of God’s moral government would be sacrificed. 6. The scheme of redemption precludes the supposition. The cross of Christ and the grace of the Holy Ghost are not vanities. They mean something. 7. The supposition is impossible and absurd. The sinner would be justified without justification, saved from guilt without salvation from it. To say that he need not be justified, or saved, is to insult God and common sense alike. God cannot dispense with His law; and as it requires righteousness, the sinner must furnish it, or continue under its condemning sentence. He must be righteous or be lost. 1. The law convinces of sin. The law condemns for sin. The law therefore kills. It cannot save. What convicts cannot acquit; what condemns cannot absolve from punishment; what kills cannot confer life. 2. One sin destroyed the possibility of Adam’s justification. The inference as to the sinner is overwhelming. 3. The righteousness of one who is already a sinner, even if he supposed that he could produce any, would be necessarily imperfect and unsatisfactory. It would not be the righteousness which the law demands. The Legalist is thrown back upon the position of the Naturalist or Indifferentist. According to his own view, he must present a perfect righteousness. He fails; and out of his own mouth will be condemned. 4. A sinner under the curse of God’s law cannot furnish any acceptable righteousness. He cannot be unjust and just, cursed and blessed, at the same time. But he may take the ground that God will relax His law. (1) God cannot relax His law. That would be to relax justice, an infinite attribute of His nature, of which the law is a transcript. (2) If He did, it would be a graduated scale adapted to the strength of each subject. And as in fact none have in themselves any strength, it would be reduced to zero. This is infinitely absurd. (3) Even were it relaxed, it has already condemned. To relax the condemnation as well as the requirement of the law would be to sacrifice justice and truth. (4) The law was not relaxed in the case of the angels that fell, nor in the case of the suffering Savior. He may contend that God will accept his sincere though imperfect righteousness. Answer: That only holds in the case of the justified believer. Finally, he may hope that his imperfect righteousness will be accepted for Christ’s sake, and be supplemented by Christ’s merit. Answer: This is impossible. There can be no compounding of law and grace, faith and works. They are contradictory and mutually exclusive. Further, Christ’s merit is infinite; and there can be no addition of the infinite to the finite, or of the finite to the infinite. The conclusion is: THe case of the Legalist, either pure or modified, which would include the Pelagian and Semi-Pelagian, is hopeless. 1. Repentance is impossible to a sinner. He is legally and spiritually dead. He cannot repent. Another view of repentance is altogether unscriptural. (1) He is under the curse of the law. If he could repent, he would be restored to God’s favor, for God cannot condemn a penitent. The sinner, then, would be condemned and not condemned, cursed and blessed, at one and the same time. (2) Repentance is a spiritual function or saving grace. It implies turning from sin to God, from [i.e., because of, or out of] spiritual motive of love to God. This [is] impossible to one in his natural condition. If it be said, that repentance removes the curse of the law: God will forgive; the answer is: First, God says He will not without blood. Secondly, repentance does not remove sentence of human law. 2. Even if he could repent, his repentance, as a confession of unrighteousness, would negative his claim to furnish righteousness. His personal condition is that of an unrighteous man. He pleads guilty, and law knows no mercy. It has already proved that mercy cannot set aside the divine law. Righteousness is required. Repentance offers no atonement for sin, and if it be supposed that God must save one as penitent, even without atonement, since no penitent being can be punished, He would contradict His own express word that without shedding of blood is no remission. To say that our tears can wash away our sins, is to impeach the love of God the Father for His dying Son. Why that blood, if our tears can expiate sin? Stop this audacious impeachment of the Cross! The supposition is impossible, and we are therefore obliged to fall back upon the scriptural doctrine that no sinner, in his natural strength, can repent. There can, consequently, be no justification and salvation on account of repentance. 3. Repentance, in one’s natural strength, would be compliance with the requirement of the law. It would be a deed or work of the law; and the Apostle declares that by the deeds (or works) of the law shall no flesh be justified. It is clear that repentance is required by the law. But nature gives no strength to meet the demand. Christ, he contends, by His merit secured a second probation for sinners. He also acquires for them the grace of the Holy Ghost to enable them to produce personal obedience. This he urges, is not a legal, but a gracious, rightousness; and consequently justification on its account is not justification by law, but by grace. On the contrary, such a righteousness, were it possible, would be a legal righteousness, and justification would be impossible. For by the deeds of the law shall no flesh be justified. The great principle which holds here is this: A righteousness receives its denomination not from the source in which it originates, but from the end which it contemplates. Take the case of the Pharisee: Judged in accordance with his claim, his case was that of Adam in innocence. Of course, had Adam produced his righteousness and been justified on account of it, his righteousness would have been legal, and his justification a legal debt. Yet, it would have originated in grace. For all his natural endowments were the gifts of the Creator. In his case, while he was innocent, there was no difference between nature and the strength of grace. Natural ability was gracious ability. Although, therefore, had he stood, he would have wrought out his righteousness in the strength of grace, it would have been a legal righteousness, because it would have been his own and because he sought justification on its account. But is is preposterous to talk of a sinner being justified in that way. The Romanist’s justifying righteousness is clearly a personal and inherent one, on account of which he seeks justification, and is therefore a legal one—that is it is a complement of his own works. But by the deeds of the law, no matter how, no matter in what strength performed, no flesh, not even Papal, shall be justified. The Apostle’s great enouncement excludes all works of our own from the ground of justification. Think of it! The agonies of Calvary undergone that the sinner may have a chance to justify and glorify himself! The blood of Jesus and the grace of the Holy Ghost mere ministers to self-righteousness! The soul sickens at the blasphemy. Justification is monstrously confounded with sanctification, and holiness, the matter of sanctification, cannot be the ground of salvation. It is an essential part of salvation; never a ground. Not that which is wrought in us by the Holy Ghost Himself can be a ground of salvation. Consider this you professing Christians. How much better are your claims than those of the circumcised Pharisee and the baptized Romanist? Solemn question! Settle it aright. Distinction admitted to be made by the Evangelical Arminian. He does not make faith the ground of justification, but he does make it the matter. The merits of Christ he holds to be the ground of justification, but faith in those merits is the righteousness which justifies. We are justified by faith, not as the instrument through which we merely receive justification, but as the justifying righteousness itself. Yet this is not a righteousness, consisting of works. In proof, they plead Abraham’s case in the fourth chapter of Romans: “Abraham believed God, and it was imputed to him for righteousness.” That is to say, Abraham’s faith was imputed to him, as his justifying righteousness: by it, on account of it, he was justified. Let us try to get at the Arminian’s position–if we can. The question being, what is justifying righteousness? He answers: Faith. Is faith then a righteousness of works? He answers: No. What then is it? It is, he says, only trust in the merits of Christ. Is it then Christ’s righteousness which is imputed to faith? He answers, no. Where then is there any righteousness at all? He answers: Faith is imputed as if it were righteousness, in place of a legal righteousness. God regards and treats it as righteousness, and this makes it evangelical righteousness. But an evangelical righteousness must consist of evangelical works. But according to the Arminian, faith is no work, it can neither be legal nor evangelical, righteousness. Yet it is the righteousness which justifies. As such it is imputed to us. What then is it? What can it be? The only solution is, that the Arminian is right in saying, Faith justifies: as to the general fact that is true; but when he undertakes to show how faith justifies, he utterly breaks down. His denial of Representation and Imputation plunges him into self-contradiction and absurdity. 1. A wholly untenable distinction is drawn between the ground and the matter of justification. What is the ground? That on account of which we are justified. What is the matter? The same. Where then is the difference? To say, then, that faith is the matter of justification is to displace Christ’s righteousness as the grounds; and on the other hand, to admit Christ’s righteousness as its ground is to confess that faith cannot be its matter. Self-contradiction is lodged in the doctrine. 2. Faith is made our own righteousness–a personal, subjective obedience. It must therefore be our own work. But this contradicts both Scripture and the Arminian position itself; the former, because it declares that by works no man can be justified; the latter, because it denies faith to be a work. There is a great principle here involved, which the Arminian theology utterly rejects, but which is absolutely necessary to the settlement of this question. It is, That we must possess—ourselves possess—a righteousness of works, which completely satisfies the requirements of the law, or else the law is dispensed with and sacrificed. There are only two ways, in which we can be possessed of such a righteousness: Either we must consciously work it out ourselves; or, another must work it out for us, and it must become ours by its being imputed to us. The Arminian holds that neither is possible; neither can we consciously work out a legal righteousness ourselves, nor can the legal righteousness wrought out by another be imputed to us so as to become ours. What then is his position? That: That while neither of these suppositions can be realised in fact, our faith or trust in the merits of Christ-—a faith or trust which is not itself a legal work or righteousness—is imputed to us in lieu of a legal righteousness, and God justifies us as believers, without our possessing any legal righteousness at all. Faith, then, which justifies, is according to his own statement not a legal righteousness. Now, to sum up: As, according to him, we have no legal righteousness, either as wrought out by ourselves, or as inputed to us, or as believing in Christ, we have no legal righteousness in any way; we are justified without having–possessing any legal righteousness. But this is impossible. God cannot pronounce us righteous unless, in some way, we are so. The proofs of this position are given, under the first head, in which the answer of the Indifferentists is considered. 3. It makes faith a suppositious, constructive and unreal righteousness. It is not the righteousness which God’s law requires, but is accepted in the place of it as though it were. But God requires a real, substantive righteousness. Now, either that is Christ’s righteousness, or our own. Arminians deny that it is Christ’s righteousness which is imputed for justification. Therefore, according to them, it is our own. But by our own righteousness, real or unreal, shall no flesh be justified. 4. The reality of faith as an instrument or condition is destroyed. If not it is part of a real substantive righteousness; but that is denied. What of reality then is left to faith? 5. As an exercise of power to believe man’s will is made to produce it, undetermined by grace. How then are we justified by grace? 6. The Arminian view is inconsistent with the express language of Scripture. Take the text: “For therein is the righteousness of God revealed from faith to faith.” Now that the righteousness mentioned here is the righteousness which justifies is so clear, that to deny it is to plunge into contradiction and absurdity. It cannot possibly be the rectitude of God; for that condemns the sinner. But if it be justifying righteousness, as, according to the Arminian, faith is our justifying righteousness, faith is said by Paul to be revealed from faith to faith! That construction of the Apostle’s language is scarcely possible. It is evident that faith cannot be the matter of justification. It cannot be the righteousness of God which is revealed to faith; and that righteousness along justifies. The Arminian denies the imputation of another’s righteousness. He affirms that faith is not a real, legal righteousness. He is therefore shut up to the infinite absurdity that God justifies one who has no real righteousness. VI. The Answer of the Lutheran and Calvinist: “We may be justified and saved only on account of the righteousness of Christ–that is the vicarious obedience of Christ–the righteousness of another, imputed to us and received by faith alone. It is of great consequence to decide aright the question, which is the “righteousness of God” spoken of in the text. 1. It cannot be intrinsic righteousness, or rectitude, of the divine nature. That is absurd. 2. It cannot be the rectoral righteousness of God—that by which He administers His moral government. This is equally absurd. 3. It cannot be faith, as was shown under the preceding head. 4. It cannot be God’s method of justification. This view is adopted by some Arminians, and by some Calvinists, as Dr. John Brown, in his Analytical Exposition of Romans. This violates the analogy of Scripture. (1) Righteousness without works is said to be imputed (Rom. 4). It would be absurd to speak of a method of justification being imputed. (2) The righteousness which is by the faith of Christ is contrasted with the righteousness which is one’s own (Phil. 3:9). There would be no meaning in the comparison of one’s personal righteousness with God’s method of justification. (3) Our guilt imputed to Christ is contrasted with His righteousness imputed to us (II Cor. 5:21). (4) Christ is made of God to us—righteousness. (5) Christ has brought in everlasting righteousness. (6) Christ is the Lord our Righteousness (Jer. 23:6). 5. The righteousness of God is the righteousness of Christ—the vicarious obedience of Christ to the precept and penalty of God’s law. Scriptural proofs: Jer. 23:6. This is His name, whereby He shall be called. The Lord our Righteousness. He who has Christ has His righteousness. II Cor. 5:21. That we might be made the righteousness of God in Him. Take the whole verse and the proof is irresistable. I Cor. 1:30. Christ Jesus who is made of God unto us . . . righteousness. Rom. 4:6. Blessedness of the man unto whom God imputeth righteousness, without works. A righteousness to be real must consist of works; but as this does not of our works, it must of another works; even Christ’s. Phil. 3:9. The righteousness which is said to be a gift, is expressly said to be the righteousness of One—that is, of Christ; and then it is, further exegetically defined to be the obedience of one by which many are made righteous. This absolutely settles the case. As the sinful act of Adam the representative of his seed is imputed to them as in him theirs; so the obedience of Christ the representative of His seed is imputed to them as in Him theirs. (1) The ground and matter (or material cause) of justification. This is the vicarious righteousness of Christ imputed to the sinner by God. (2) The constituent elements of justification. These are, first, pardon, or the non-imputation of guilt; secondly, the acceptance of the sinner’s person as righteous, and his investiture with a right and title to eternal life. (3) The instrument or organ of justification. This is faith. It receives and rests upon the righteousness of Christ, which God imputes. Taken generally, justification may be said to consist of three things: first, the imputation of Christ’s righteousness; secondly, the non-imputation of guilt, or pardon; thirdly, the acceptance of the person as righteous and the bestowal upon him of a right and title to eternal life. But taken strictly, justification is the non-imputation of guilt, or pardon, and the acceptance of the person as righteous and the bestowal upon him of a right and title to eternal life. The ground and the constituent elements ought not to be confounded. It is not: justification is the non-imputation of guilt and the imputation of righteousness, which would seem to be the natural antithesis. But first comes the imputation of Christ’s righteousness, as the ground, and then the elements or parts, of justification—namely, pardon and acceptance. Faith is no part of justification. It simply receives the righteousness of Christ, offered as the ground of acceptance and relies upon it. It is the condition—as an indispensable duty—without which we cannot be acceptably justified. It is Emptiness filled with Christ’s Fulness. It is Impotence lying down on His Strength. It is no righteousness; it is no substitute for righteousness; it is not imputed as righteousness. It is counted to us simply as the act which apprehends Christ’s righteousness unto justification. All it does is to take what God gives—Christ and His righteousness. Illustration: A wounded soldier with both arms shot off, lying on his back helpless, fed from a bowl in the hands of a Christian nurse–a ministering angel to him in his inability. The dying man’s receiving life. Either, we may be justified without any righteousness. Or, we may be justified on account of a personal and inherent righteousness. Or, we may be justified on account of a vicarious and imputed righteousness. To state them more briefly: Either, no righteousness; or, Our own righteousness; or, Another’s righteousness. The first and second suppositions have been disproved. Therefore the third remains established. The vicarious obedience of Jesus, our Substitute, to the precept and penalty of the divine law is the righteousness of God, which is revealed from faith to faith. It is fitly termed the righteousness of God, not only because Christ’s righteousness was provided, and is accepted, by God, but because it was wrought out by God Himself in the person of His Incarnate Son. It is God’s righteousness, because God produced it. This is imputed by God to the believing sinner, who had no share at all in its conscious production. In that sense, it is not his, but another’s righteousness. But as Christ was his Representative and Substitute, and His righteousness is imputed to the believer, in this sense, it becomes his. It is his in law, before the divine tribunal. God therefore is just in justifying him, since he has a perfect righteousness, such as the law demands and such as satisfies its claims. When the sinner by faith accepts Christ, with this righteousness, he is actually and consciously justified. This righteousness is “antecedently and immediately” imputed to all the elect, in mass in the justification of Christ as their Federal Head and Representative, upon His resurrection and appearance in the heavens. The application is obvious: There is one only way of justification and salvation. Believe, take Christ’s righteousness and be saved. Reject this justifying righteousness, and you are lost. In keeping with the General Assembly of the Presbyterian Church in America, which began meeting this past Tuesday, and will have concluded either late on Thursday, or not later than noon on Friday. The following charge brought at the ordination of a young minister, here concluded, seems quite appropriate to the occasion of a General Assembly. There is some wonderful wisdom in this charge. I pray you will be edified. At the ordination of the Rev. J. F. Lanneau, in this city on the 1st of May, the following charge was given by the Rev. Dr. [Aaron Whitney] Leland; and it is now published at the earnest solicitation of may who heard it. Permit me to warn you, my brother, against those hostile influences by which you will be surrounded. If you are a devoted, active servant of Christ, be assured you will encounter opposition. When it comes, be not surprised. Be meek and patient towards open adversaries, cautious and courteous towards secret foes, and doubly guarded against flatterers. If you happen to be popular, your danger will be imminent. You will be placed in the fore-front of the hottest battle. For in that case saints and sinners will unite, and make common cause with the powers of darkness, to destroy you—all vying with each other in presenting to you deadly poison in the most alluring disguise—and all furnishing weapons to the enemies in your own bosom, to pierce you through with many sorrows. If such a hazardous eminence should be allotted you, I charge you to cast yourself down in deep humiliation, at the Saviour’s feet; lay fast hold of the Cross, and cry mightily to God for grace to help you in such a time of pressing need. Clerical popularity is a formidable foe. It has despoiled many a Christian soldier of his armour, and cast him down wounded; and many a proud sun of Levi it hath hurled from the battlements of Zion, down to the depths of perdition. Of this insidious, murderous enemy, I charge you to beware, as you prize your usefulness—as you value your own soul, or the souls of others. Nor would I fail to warn you of an opposite danger, less formidable indeed, but by no means to be disregarded. I allude to the trials and temptations to which you will be liable if you should be unpopular. And unpopular you may be, though you prove a devoted, able, faithful Minister of the New Testament. So was Edwards, the master spirit of his age—the mighty leader of American Theologians; and so was Scott, the excellent Commentator. Should this evil befall you, guard your heart against its influence,. It will prove a severe trial of your graces, and you need all the fortitude and self-denial you can obtain, to sustain with calmness the neglect, or unkindness, or opposition of those fro whom you are laboring and praying continually. Be assured that all the secret and open enemies of religion, will gratify their hatred of the Gospel by pouring the vials of their wrath upon you, and trampling your feelings in the dust. Should this ever be your lot, you will be able to judge whether you have a heart to love your enemies, to bless them who curse you, and to pray for those who despitefully use you. You will also be liable to ascertain whether you possess the spirit of Him, who when he was reviled, reviled not again—who prayed for his persecutors and slanderers, and who laid down his life for those who cried away with him from the earth—not this man but Barrabbas—crucify Him. While you labor as an Evangelist, you will find your sphere of action attended with many dangers. Among these permit me to mention the neglect of study, and mental discipline, and deficient, desultory preparation for the pulpit. Wherever you are, and whether you feel the necessity or not, it is necessary for you to give yourself to reading and composition, as well as to exhortation and doctrine. I charge you not to neglect the gifts which have been bestowed upon you, but to study to approve yourself a workman that needeth not to be ashamed, rightly dividing the word of truth. If you are called to a pastoral charge, new difficulties and new trials will be experienced. When you are preaching as a candidate, with a view to settlement, beware of exciting too high expectations, by giving specimens of ability, which you cannot habitually equal. In his way, many young Ministers fatally impair their usefulness, and prepare for themselves a bed of thorns. They have a few sermons, most elaborately prepared; containing all the ornaments and treasures they have accumulated during their whole preparatory course. These are delivered with great spirit to vacant congregations, and are heard with admiration.—The result is a speedy settlement. But mark the grievous disappointment. When the regular pastoral labors commence, it is evident that the stock is exhausted; and the idol of popular favor, and the prodigy of talent and erudition, sinks down into a very ordinary preacher.—Such a course every wise man will carefully avoid. Let not the preface to your book be greatly superior to all the rest of its contents. Begin no loftier flight, than your strength of pinion can sustain. Always husband your mental resources, and reserve your noblest efforts, to stem that current of reaction, which you will be sure to meet, after a spring-tide of popularity; and which may require all your resources and energies to withstand. And when the excitement of a new pastoral union thus subsides, and the ordinary labours of a parochial charge have really begun; when the people find that their new favorite is a mere mortal man, compassed with infirmity; and he makes a similar discovery in relation to them; then come the real labours, and trials, and temptations of a Minister of the Gospel. Make up your mind to fail in satisfying all your hearers. You will certainly find unreasonable demands, which you cannot gratify. When some require you to speak louder, and others lower—when some expect you always to be in your study, and others always visiting—when some cannot endure to hear a sermon read, and others are disgusted at preaching extempore—amid such conflicting demands, what can you do? Evidently your only course is to go straight forward in the conscientious performance of your duty, and leave the event to God. But I will not, on the present occasion, enter the field of your pastoral duties. That may more appropriately claim attention at your future installation. I feel it important, however, to give you one or two directions as to your course in relation to this subject. In view of a permanent settlement, I counsel you never to accept a call, when there is an opposing minority, unless you are well assured that such opposition is directly solely against the essential doctrines of the Gospel, and is wholly unmingled with personal dislike. A settlement in a divided Church, with the hope of future reconciliation and harmony, is about as wise, as a marriage between parties mutually offensive to each other, formed with expectation that affection will spring up in after life. On one more point I offer you my counsel. Should you be settled in the ministry, and find dissatisfaction arising, and symptoms of a desire of change exhibited by any considerable portion of hearers; I advise you to demand a separation without delay.—Any five men in a congregation, who resolve to oppose a Minister, and to create dissention, always succeed. A Pastor’s change of success, in such a conflict, is about as great, as that of a man bound hand and foot, against the attacks of half a score of well armed assailants. And even if there be no open opposition, if you perceive that your usefulness has declined, that your preaching is attended with listless indifference, and that, some how or other, your influence is evidently diminished—your path of duty is plain—seek another field of pastoral labour. Immense injury is done to the cause of religion, by the perseverance of Ministers in situations where they cannot be useful, because they find it inconvenient to remove. I beseech you never to be of the number of those who, to preserve a support, or avoid the pain of separation, continue to occupy ground they cannot cultivate, and thus prove an actual obstacle to the prosperity of churches they profess to love. Most evident is it, that there are in our land scores of Pastors, who would do more good, by a change of location, than they ever did in their lives. I charge you, my young Brother, never to hold a pastoral office, after you are convinced that the spiritual interests of the church are not promoted by your ministry. In maintaining the discipline of the house of God, I charge you to be vigilant and faithful. Entrusted with the seals of the covenant, see to it that you do not desecrate them by an unworthy appropriation. Ever bear in mind, that it is an important part of your duty, to attend regularly the judicatories of our church, and to fulfill, if possible, all presbyterial appointments. Whenever you are called to examine candidates for the ministry, I charge you to act impartially and conscientiously. Lay hands suddenly upon no man, neither be partaker of other mens sins, keep thyself pure. With these directions and cautions, and with most affectionate wishes and fervent prayers for the success of your ministry, I bid you God speed. Go forth, my Brother, into the vineyard of the Lord, to watch and labour, to live and die in His service. Work while the day lasts—the night cometh when no man can work. The more laborious and indefatigable you are, the more welcome and delightful will be the rest which remaineth to the people of God.—Adopt as your own, that illustrious motto—“expect great things—attempt great things.” Set your standard high, and press towards the mark to secure the prize of your high calling. Commissioned to watch for souls as one who must give account, cherish a severe conviction that you have one great business in this world—to persuade perishing rebels to be reconciled to God. Wherever you go, let your desires, and prayers, and efforts be concentrated to one point—a revival of religion, an ingathering of souls into the fold of the good Shepherd.—Failing in this, you labour in vain. Whatever else you may accomplish, however high your reputation, or overflowing your assemblies, be assured, that, unless you rouse Christians from apathy, and pierce the hearts of the impenitent with the arrows of conviction, you utterly fail in effecting the great purpose of your ministry. Fix then your heart, with unconquerable desire, upon witnessing a mighty work of grace, a glorious effusion of the Holy Spirit, wherever you are called to labour. Let this be the leading object of all your sermons. Get your whole soul under the influence of eternal things, and address perishing men, as if the judgment bar was full in your view. Strive to realize that Christless souls are on the brink of everlasting burnings; and then you will be in earnest in urging them to escape for their lives, and flee from the wrath to come. And take heed, my brother, when you denounce the terrors of the Lord, and warn the wicked of approaching wrath, that your language and manner be such as to convince them that you are constrained thus to address them by love to their souls, and by a full conviction, that, unless they repent, they must perish. Beware of a reproachful, vindictive manner of uttering such awful truths, as if you loved to utter them. It has a most hardening, injurious influence. Let it be evidently your delight, to beseech men to be reconciled to God. And now, my dear young Brother, having given you these instructions, and delegated to you this spiritual authority; in the name of the great Head of the Church, and as the official organ of this Ecclesiastical Judicatory, I solemnly charge you to take heed to this ministry which thou hast received, that thou fulfill it. Let no man despise thy youth; but be an example to believers in word, in conversation, in charity, in spirit, in faith, in purity. Meditate on these things—give thyself wholly to them, that thy profiting may appear to all. Take heed to thyself, and to thy doctrine, for in so doing thou shalt both save thyself, and them that hear thee. Be strong in the grace which is in Christ Jesus. Endure hardness as a good soldier of Jesus Christ. In all things showing thyself a pattern of good works—in doctrine showing uncorruptness, gravity, sincerity—sound speech that cannot be condemned, that opposers may be ashamed, having no evil things to say of you. Finally—I charge thee before God and the Lord Jesus Christ, who shall judge the quick and the dead at his appearance—preach the word—be instant in season, out of season—reprove, rebuke, exhort, with all long suffering and doctrine.—Watch in all things—endure afflictions—do the work of an Evangelist—make full proof of thy ministry. I give the charge before God who quickeneth all things, and before Jesus Christ who before Pontius Pilate witnessed a good confession, that thou keep this commandment, without spot, unrebukable, until the appearance of our Lord Jesus Christ. Be thou faithful unto death, and thou shalt receive a crown of life.